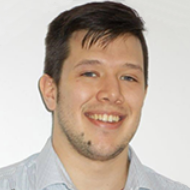 Mark works for Sweco in Edinburgh as a Graduate Consultant on the remediation team. His main role is to maintain a site presence on large scale ground improvement projects such as the Glasgow’s City Council Surface Water Management Scheme and Sighthill Project. On top of this, Mark manages contractors during both the site investigation and construction phases of projects to ensure suitable analysis of potentially contaminated land is undertaken and the subsequent remedial works are completed to specification. Mark finds that the most challenging aspect of his role is managing the communication between the client, Sweco as the designers/supervisors and the contractors to maintain a healthy work relationship and balance all parties’ agendas to deliver projects in a cost efficient, environmentally sensitive and timely manner. Mark studied Geology at the University of Edinburgh and after graduating, pursued a career in mineral exploration in South-West Scotland. He subsequently used this experience to join REC Ltd where he worked as both a contractor and a consultant on projects such as the A96 Dualling scheme and numerous wind farm projects, alongside his current employer, Sweco. Sweco took Mark on as a Graduate where he has remained part of the team since. As soon as the Technician designation was made available, Mark’s Technical Manager made him aware of the opportunity and the benefits to his career, so he applied. He feels, as a Registered Environmental Technician, he has the opportunity to be recognized as a professional who is committed to a high standard of environmental awareness and self-improvement, benefitting both himself and his employer. Throughout his career, Mark has honed the ability to assess a site ready for development to environmental standards and gauge, through historical assessment, the impact of previous industry on the site, the impact to users on and adjacent to the site and the impact to the environment on and surrounding the site. By assessing the potential impact of historical industrial users on the site, he is able to recommend a suitable site investigation to establish the extent of contamination and impact to the site and subsequently assist in designing remedial measures to ensure the site is suitable for future users, reducing the impact on the local environment. Mark believes that within the environmental sector, technicians are a key force, linking theoretical design and development work with the practical involvement and investigation required on site. Technicians are a point of data gathering and communication between a wide variety of interested parties from clients to contractors. The dialogue between the on-site presence of a technician and the client is essential to a successful project. Mark aims to reach a Senior position in the future (though knows that’s a while away yet) so plans to gain his Chartered status over the next few years.